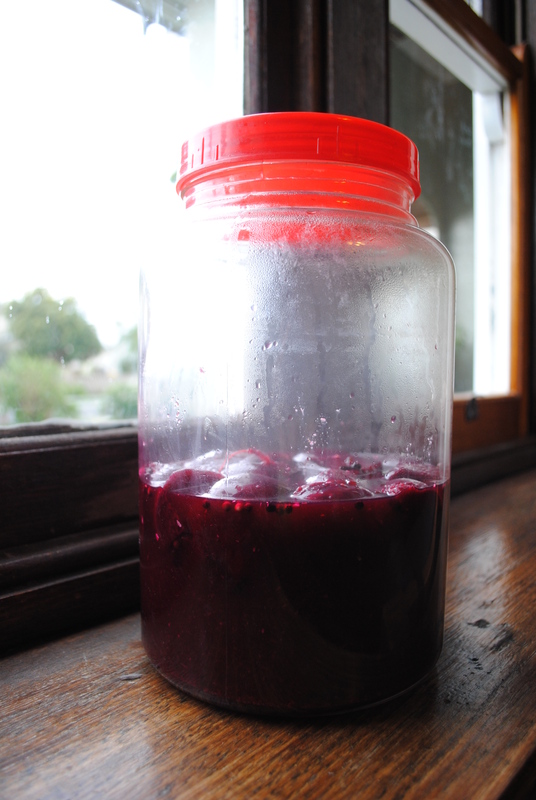 I always have beetroots in the garden – when one lot comes out, another goes in – so I get pretty excited when I have enough to pickle, all ready at the same time. The recipe says 3kg, but that’s a lot if you’re using homegrown, so I adapt the quantities accordingly. 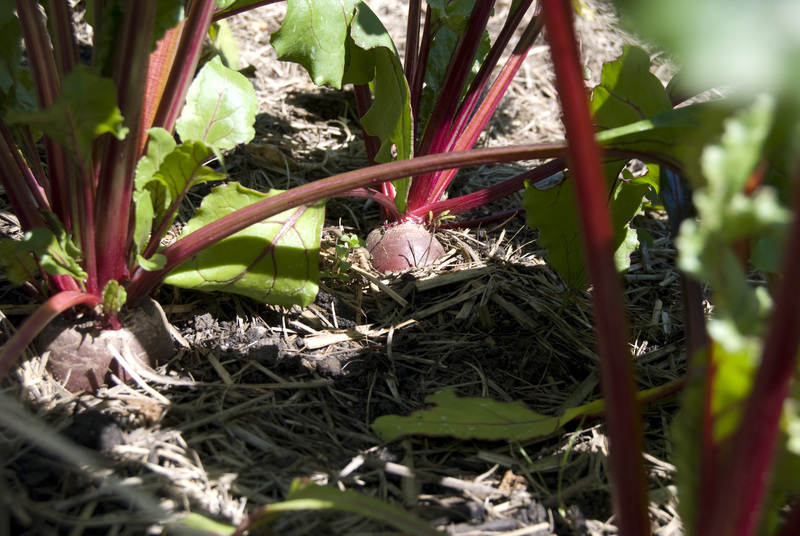 Chop the leaves off and give the beets a wash in cold water, removing any dirt. Keep a few centimetres of stalk and leave the roots attached, as this helps maintain both the colour and nutritional value of the beets when you cook them. 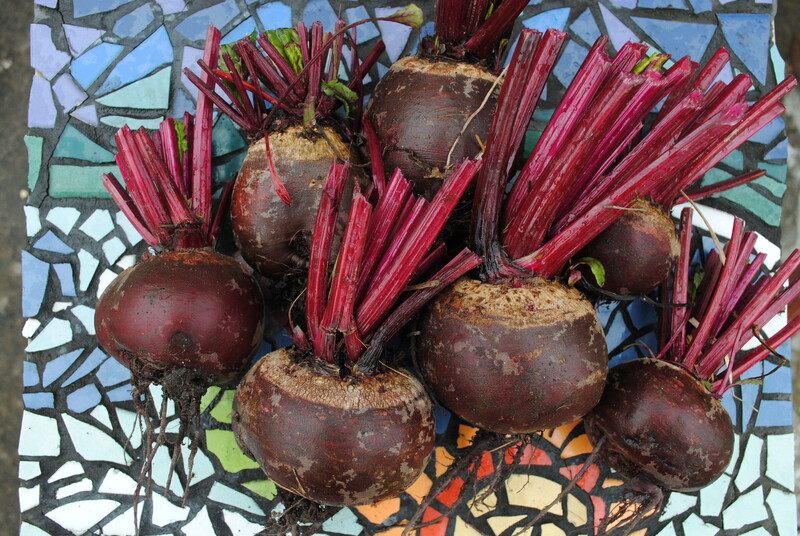 Cover the beets with water in a large pot, add the salt, and boil until cooked through; 20 – 30 minutes is usually enough, dependent on the size of the beets, as you don’t want them too soft. Once they’re cooked, drain and rinse in cold water and peel immediately. This is as easy as sliding the skin, roots and stalks off with your hands – no peeler necessary. While the beets are cooking, make up the pickling solution by adding all the ingredients, except the horseradish, to a pot and bringing it to the boil. Add the beets (you might want to halve or quarter the larger ones) and bring the whole kit and caboodle to the boil, cooking the mixture for five minutes or so. Once the beets have cooled a little, put them into clean jars and pour the pickling solution over to cover. Leave the lids off the jars for about 20 minutes, to allow the liquid to cool, then add the horseradish, stir through, and put the lids on, making sure they’re done up nice and tight. 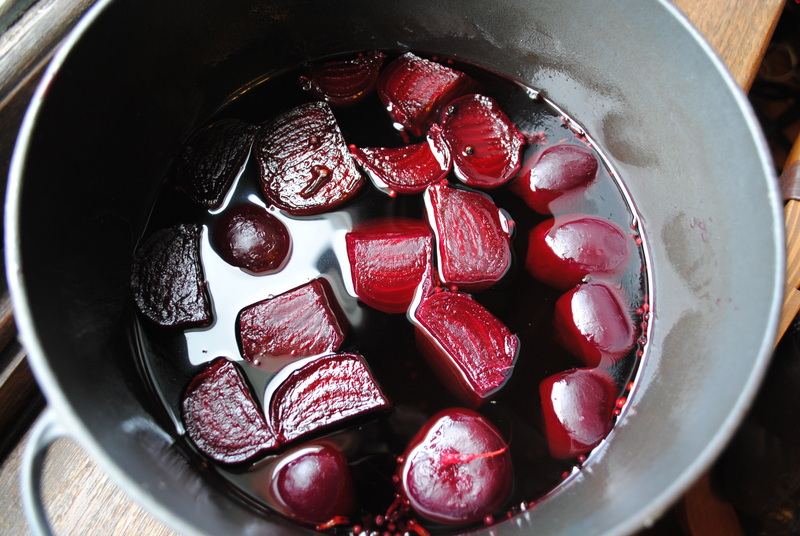 Leave the beets for two weeks or more before serving them up, to make the most of the pickling process. As you can see, I use a very large jar. This is because I keep adding more beets and solution as my beetroots mature, so we have these amazing things at hand all summer and into autumn. Store the jar in a cool place away from direct sunlight and there’s no need to refrigerate once you’ve opened it – the brine does the all the preserving tricks for you. The horseradish is definitely the secret ingredient in these pickles – there’s something about the combination of that wily little root and its earthy cousin that enters into the realm of ambrosia.